Ginger Spice Cookies are YUMMY. From Jen, our manager at Glover Park Hardware and baker extraordinaire shares a couple of her yuletide faves. 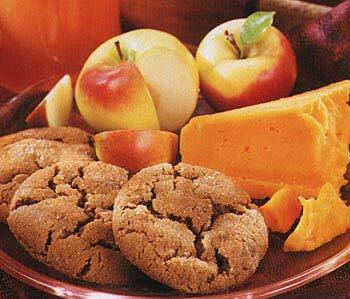 Arrange the soft, spicy cookies on a platter with apples and Vermont cheddar cheese; also serve hot cider or hot buttered rum. Combine first 6 ingredients in medium bowl; whisk to blend. Mix in crystallized ginger. Using electric mixer, beat brown sugar, shortening and butter in large bowl until fluffy. Add egg and molasses and beat until blended. Add flour mixture and mix just until blended. Cover and refrigerate 1 hour. Preheat oven to 350°F. Lightly butter 2 baking sheets. Spoon sugar in thick layer onto small plate. Using wet hands, form dough into 1 1/4-inch balls; roll in sugar to coat completely. Place balls on prepared sheets, spacing 2 inches apart. Imagine peanut brittle that is as delicate as lace, with the familiar buttery crunch. Put oven rack in middle position and preheat oven to 350°F. Line baking sheet with nonstick liner. Combine butter, sugar, corn syrup, and cream in a 2-quart heavy saucepan and bring to a boil over moderate heat, stirring constantly. Add flour and salt and cook, stirring constantly, until batter is slightly thickened, about 1 minute. Stir in peanuts. Working in small batches, drop level teaspoons of batter about 3 inches apart on lined baking sheet. Bake until golden and bubbly, 5 to 7 minutes. Cool on baking sheet on a rack 1 1/2 minutes. Quickly but carefully flip cookies over with spatula. Working quickly, roll 1 cookie around handle of a wooden spoon and immediately slide cookie onto rack to cool completely. Repeat with remaining cookies. (If cookies become too hard to roll, return them to oven briefly.) Wipe down bakeware liner with a paper towel and bake and roll remaining cookies.